Xiaomi Redmi 7 will be making its public debut today at an event in China, which has been awaited long time now in its home market. The Chinese smartphone maker is also expected to introduce Redmi Note 7 Pro alongside Redmi 7 device, as per the market reports. To be introduced as a successor to Redmi 6, the new Xiaomi Redmi 7 is rumoured to be extensively upgraded version of the predecessor. The launch event of the smartphone is scheduled to commence at 2PM CST (11.30 AM IST) in Beijing, China. The company will also be broadcasting the event, which can be watched here. Xiaomi Poco F1 Lite Smartphone Specifications Leaked Online; To Get 4GB of RAM & Snapdragon 660 SoC. Spotted on Geekbench, the key specifications of the smartphone has been revealed ahead of the launch. The listing suggests that the Redmi 7 will be packed with 4GB of RAM, Qualcomm Snapdragon ‘msm8953’ chipset, Android 9 Pie based on MIUI 10. The phone will sport 6.26-inch LCD HD+ display screen with resolution of 1520x720 pixels and aspect ratio of 19:9. Under the hood, the phone will be powered by an octa-core chipset – Snapdragon 625 SoC which will be clocked at 1.8 GHz. Some reports also claim that the phone will sport Snapdragon 632 SoC. The smartphone is expected to be offered in three variants that will vary as per the configurations offered – 2GB + 16GB, 3GB + 32GB & 6GB + 64GB. The overall design of the smartphone is expected to be similar to Redmi Note 7 and Note 7 Pro. The phone will sport two rear cameras along with single sensor upfront within Dot drop notch. The primary sensor is expected to be a 12MP whereas there is no information about the secondary lens. The front camera could be an 8MP sensor for selfies and video calling. The smartphone will be backed by a massive 4000 mAh battery which we have already seen on the new Redmoi 7 Series. 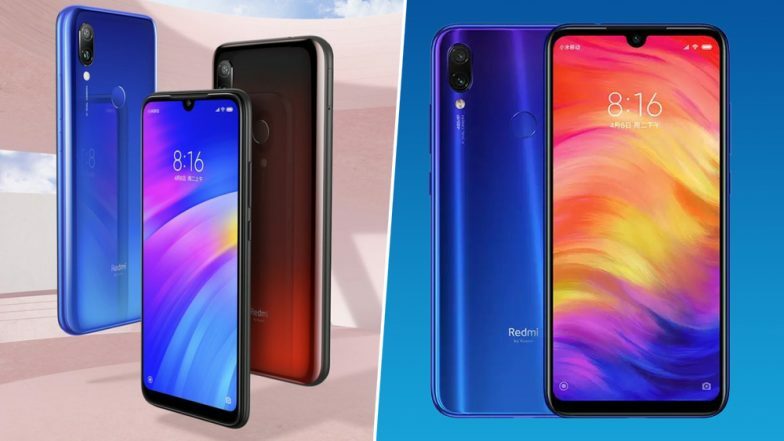 Xiaomi Finally Launched Redmi Note 7 Pro & Redmi Note 7 Smartphones; Priced in India at Rs 9999 & Rs 13,999. Coming to the price point, the base variant - 2GB + 16GB of Redmi 7 is likely to be priced from CNY 700. The top-end model of the smartphone could be priced up to CNY 800. As a reminder, the price of the smartphone was tipped by CEO Lei Jun. As far as the Indian market is concerned, the new Xiaomi Redmi 7 phone will be introduced soon.